When the water faucet handle on your bath or shower is loose, turning the handle may affect water flow only a little or not at all. If the faucet has only one handle, you may be able to turn the water on, but you may not be able to control the temperature and could end up being scalded. Similarly, if one of the handles on your two-handled faucet is stripped, the bath or shower water could be very hot or very cold, depending on which handle is damaged. To make things worse, if you do manage to turn the water on, you might not be able to turn it off. When a water faucet handle is stripped, the handle itself is often at fault. It may be cracked or the splines that pair with those on the valve stem could be worn. Sometimes, though, it's the valve stem that's causing the problem. You can replace the handle or the valve cartridge, depending on which is at fault, but a simple fix might get you back in business even without replacing parts. Even though you may simply have to replace the handle, it's a good idea to turn off the water to the bath or shower before you begin the repair. If you can't find a dedicated shutoff valve, locate the main shutoff valve for the house and turn it off. Now if something goes wrong, you won't be in danger of being flooded – and possibly scalded – by pressurized water. The next thing to do is to remove the handle that's giving you the problem. In theory, that's just a matter of popping off a cap with a flat-head screwdriver, unscrewing a Phillips head screw and pulling the handle off. The handle could be stuck by scale, though, and may not come off no matter how hard you pull. This is a job for a handle puller, which you can buy or rent at any plumbing supply outlet. It works like a corkscrew, anchoring against the center nut and pulling the handle from behind. It won't work with a lever-style handle, though. For that type of handle, a flat bar is often the best tool for prying it off. When you remove the handle, you'll be able to tell whether the handle is cracked. If so, replace it. If it's still in good shape but the splines on the handle or the valve stem are worn, try wrapping plumbing tape around the valve stem and reseating the handle. The plumbing tape may provide enough grip between the handle and faucet to operate the faucet. If so, replace the screw and cap, and you're done. 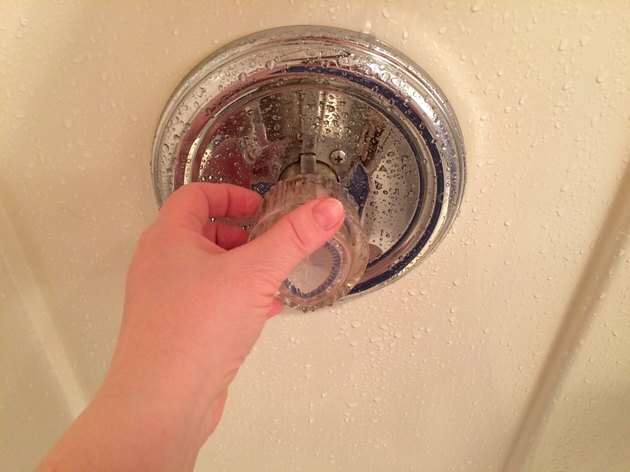 This trick can work for any faucet, not just a shower faucet. When you pull off the handle, you may notice that the faucet stem is stripped. Instead of having sharply defined peaks and valleys, the splines may look like the rolling hills of the Badlands. Sometimes you can make the splines more well defined by filing them with a metal file. That's another trick that could save you from having to buy new parts. If it doesn't work, the only option is to replace the faucet stem. To do this, you'll have to remove the faucet valve. This usually involves unscrewing a retaining ring with a wrench, but on some faucets, including many Moen cartridge faucets, you have to pull a retaining clip using needle-nose pliers. It may take some effort to actually extract the valve, and you may need a valve puller, which you can also get at plumbing supply outlets. Once the valve is out, take it to the plumbing supply or hardware store to use as a reference when shopping for a replacement. There are many different faucet models out there, and it's best to have the old valve in hand when you're looking for a new one.